Some materials work better than others at creating a beautiful and efficient home. They work so well we see them pop up again and again throughout history, an important part of the structure of where we live. Travertine is one of those materials that has not only stood the test of time, you can also find it spanning across many geographical locations. Travertine is plentiful in many regions throughout the world, making it an all-around reliable and easy-to-find building product. Travertine was used in Ancient Egypt, was used by the Greeks, and used to build the long withstanding buildings we still can see scattered across Europe representing the Roman Empire. Head to the Roman Coliseum and you’ll see travertine on display as one of the key building materials. And if it can stand the test of time in a place still on display today, it can be the perfect addition to your home, from flooring, to backsplashes, to pavers, to sinks and more. Hallways and Entries – travertine can add a touch of class and elegance, and make a grand statement as people pass through your door. Bathrooms, Tubs, Showers and Vanities – travertine is a popular surface to bring a relaxing look and feel to every corner of your bathroom. 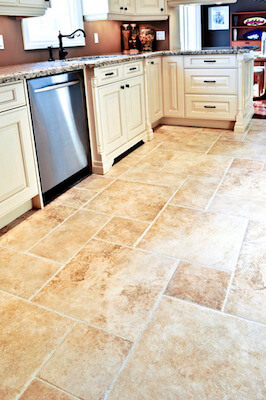 Because of its versatility, you can use it in many ways, from small detail work, to large tiles on your floor. Family and Living Space – while travertine tile may not be the first choice in our colder Colorado climate, it can be a good choice, especially when combining it with radiant heat or with cozy area rugs. It’s the perfect choice for creating a calm and serene environment. Kitchens – the kitchen is the hub of the family home. Because so many activities take place – from cooking, to parties, to homework, to relaxing – travertine offers the perfect flooring choice for easy care and maintenance. Courtyards and Patios – the look and feel of travertine doesn’t have to stop at your doors; carry the look from inside to out. It’s a great addition to your outdoor room space, including patios, courtyards and eating and grilling space.